Our Patio is Now Open! Welcome to SusSPECIAL! 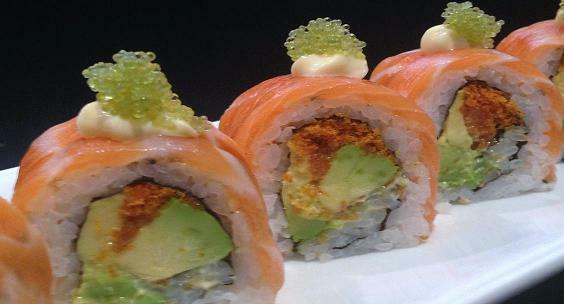 -Before Sunrise Roll- California roll topped with fresh salmon, cream cheese and green tobiko served with our Chef special sauce.hi Thai Libertyville! Welcome to Sushi Thai Libertyville! We offer different variations on authentic Thai & Japanese cuisine that is unique and yet traditional. Our menu includes Sushi & Thai curries, noodles, rice dishes, and house specialties! We have fresh fish every day and our style of fusion with Sushi & Thai just brings joy to your taste buds. While our menu is extensive, every dish is prepared with elegance, proving that the kitchen is skilled in crafting both Thai and Japanese cuisine with such intricate presentation of taste and flavor. Don’t let our simple décor fool you, but do try our take of Japanese & Thai fusion.